With Free M4a to MP3 Converter you can convert individual M4a, M4b, AAC, 3GP, MP4 files to MP3 or WAV. However, it is also possible to convert entire folder containing such files, including all subfolders in the selected folder. 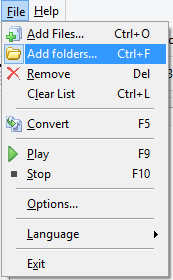 This will switch the button into the "Add folders" mode, so subsequent clicks on the button will open the "Add folders" dialog instead of the "Open files" one. 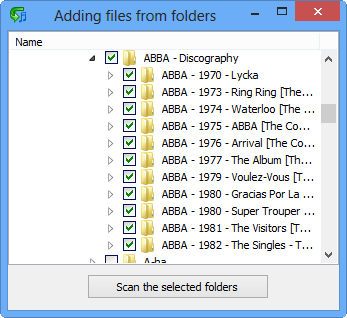 In this window, select folders containing M4a, AAC, M4b, 3GP, MP4 files that you want to convert MP3 or WAV. The files will be added to the conversion list. Now you can simply click the "Convert" button on the toolbar.